Popular city milkshake shop Eskimoo on Guildhall Street will be expanding its franchise further with a new store in St Mark’s. Eskimoo is known for creating milkshakes out of almost any chocolate bar or confectionery on sale, as well as the normal fruit shakes. The new Eskimoo, which will be the third in the county, will take over the unit where IYLYKIT gift shop used to be, near the pedestrian crossing (pictured). Other than the usual quirky serving area, there will be bar stools for customers as well as a breakfast bar in the windows. A serve-through window would be used so customers won’t need to queue inside the shop for their shake. The shop will also employ two new full-time and eight part-time employees. Manager Robert Payton said: “The unit in question is the former gift shop. “We were aware of the seemingly high turnover of previous tenants at the unit, having formerly been a café, a travel agents and a clothes shop, before becoming a gift shop in October 2009, but we feel it is the perfect location for us. “It’s very close to the university and student accommodation, a stone’s throw from St Mark’s and the footfall on that area of the High Street, particularly at the crossing, is tremendous. 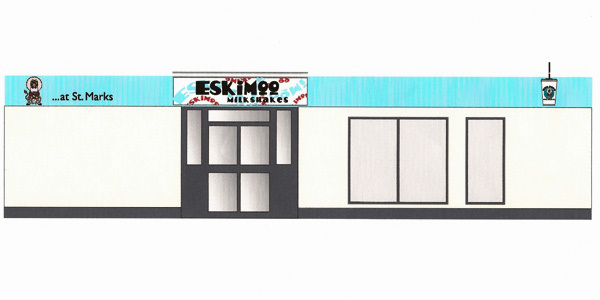 “We believe there is a market out there for a second Eskimoo in Lincoln and we are sure the people of Lincoln will embrace it as they have the first, which opened in October 2008. A sketch of how the new St Mark's Street Eskimoo could look. Although the milkshake menu will be the same, for the launch Eskimoo will offer 10 “Grand Opening Shakes”, which Guildhall employees created. Payton added: “Sales of the shakes will be tracked, and whoever sells the most in the opening month wins a cash prize. “Shakes such as Banoffee Pie, (Banana, Toffee Syrup and Hobnobs), Strawberry Meringue and the Caramel Yeti (Milky Bar with Choc Chip Cookie, Cream & Butterscotch Sauce) will all be on the menu for the grand opening. The new shop will open on March 17.